What if You Filed Your Taxes & Forgot Interest Income? File an amended return to correct omissions on an earlier return. 2. What if I Forget a Tax Form 1099-INT? 3. Do I Need to File a 1099 Form for a Savings Account? Say you sent off your completed tax return and then received a late 1099 form in the mail from a savings account you forgot about. The account earned interest, which you’re obligated to report on your tax return. Depending on how much interest the account earned, you may even owe additional tax because of it. Don’t panic. 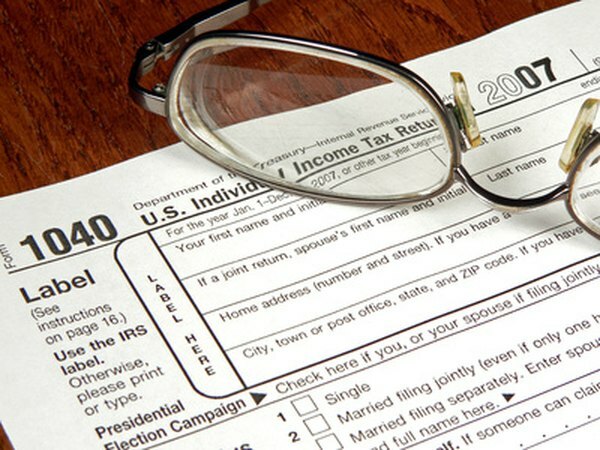 You can file an amended tax return and avoid trouble with the Internal Revenue Service. The amended return makes it easy to see if you owe any additional tax on that interest. Download Form 1040X -- Amended U.S. Individual Income Tax Return from the IRS website. Also, download a blank Schedule B – Interest and Ordinary Dividends. Be sure you’re using the most current version of the form, usually dated for most recent tax year. For example, in the summer of 2012, the most recent version of the 1040X form was dated 2011.
Review the copy of your tax return you filed -- the one that didn’t include the interest income. Use the information from Schedule B on your original return to complete a new Schedule B. Add in the new interest you need to report. Complete the first section of Form 1040X. Fill in the original amounts you reported to the IRS for income and deductions in column A. In column B, put the amount of the new interest income you’re reporting in column B, line 1, Adjusted Gross Income. This represents the amount the new interest will increase your adjusted gross income. Add columns A and B together and put the totals in Column C.
Complete the remaining sections of Form 1040X. The form will take you through the process of figuring the new tax amount you owe. In Part III of the form, provide an explanation of why you’re filing this amended return. For example, you might say that you did not originally receive the Form 1099-INT or you overlooked it in preparing your taxes. Sign the Form 1040X. Attach the new Schedule B. Make a copy of both forms for your records. Write a check for any taxes you owe and mail everything to the tax processing center for your area. You have three years after you file your original tax form in which to file an amended return. File as soon as you discover your mistake to avoid penalties and interest. Resist the temptation to not report a small amount of interest. The IRS automatically matches form 1099s with the income shown on your tax return. If the agency finds an error, you could be assessed fines and interest. Does Amending Taxes Red Flag Them for Audit? What to Do if You Are Missing Tax Documents?